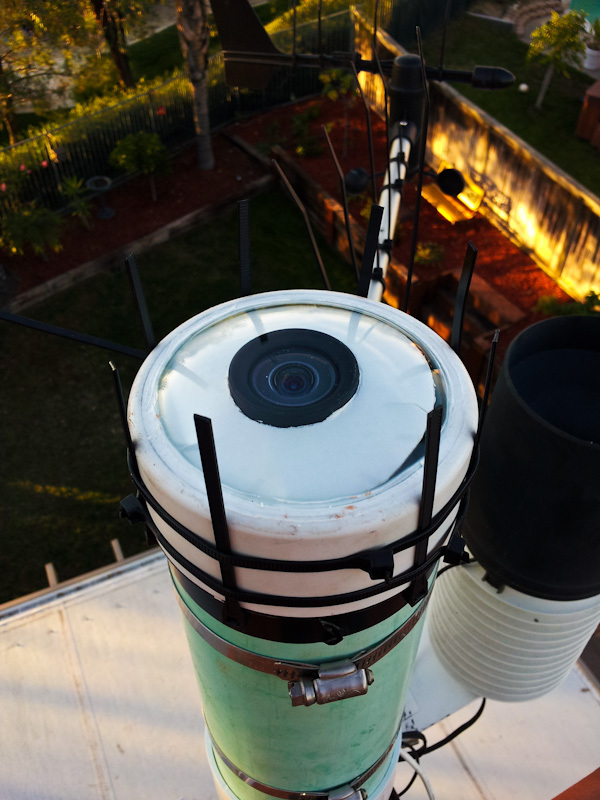 The allsky camera is mounted on the roof of a home in Temecula. The light pollution limits the magnitude (faintness) of the stars visible. On those nights when it is visible, you can watch the International Space Station pass over head. (Along with other satellites). The camera can see faint objects because it collects the light for a few seconds before updating your screen. 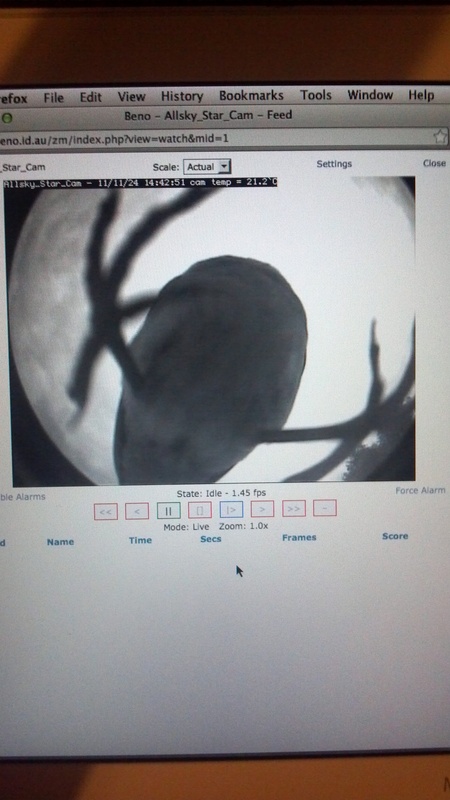 That’s why at times the video seems a little jerky, on a moon lit night or through the day, the video stream is smooth. 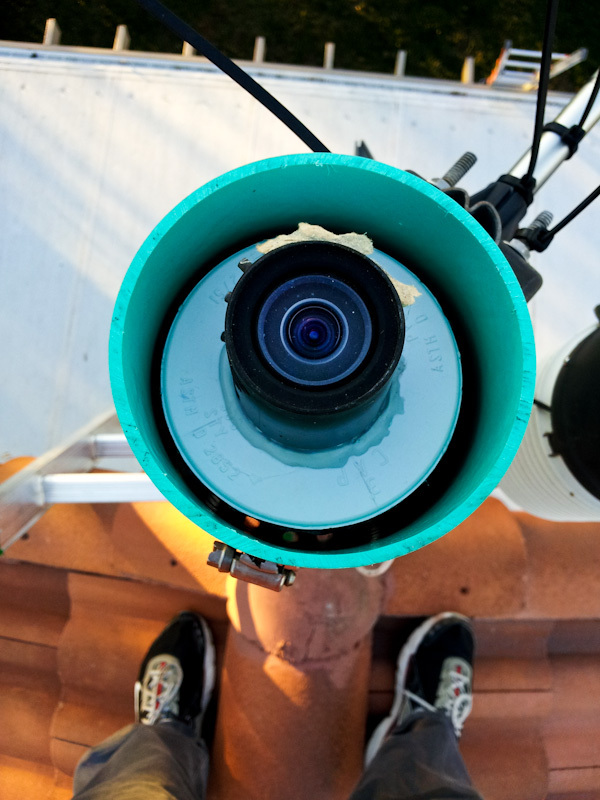 Check out the ‘Allsky Review’ page to load up a viewer that allows you to step through the last 50 frames from the allsky camera. This is a great way to examine the past few minutes at your leisure. Its also a great way for those of you who use IE as their main browser to see what you are missing out on. Ben’s wife (Freddy), is just crazy about Humming birds. We like to give the folks back home in Australia the chance to see humming birds in action. There are two feeders, in time we hope to get a camera on the second feeder. If you are using IE 6,7 or 8. Don’t. Download and use another browser. Your computer will thank-you (and the video streams from the cameras will work). The camera is an 128 frame integrating video camera I had in Australia. Its rated at .0001 lux. I have outlined a few of the points of interest. As you can see, I have had this camera running for many a year. I had installed the camera pretty much as soon as I arrived in America, but the heat of summer soon gave me some hot pixels, so we had to take it down until we came up with a better housing. The housing is a work in progress……. 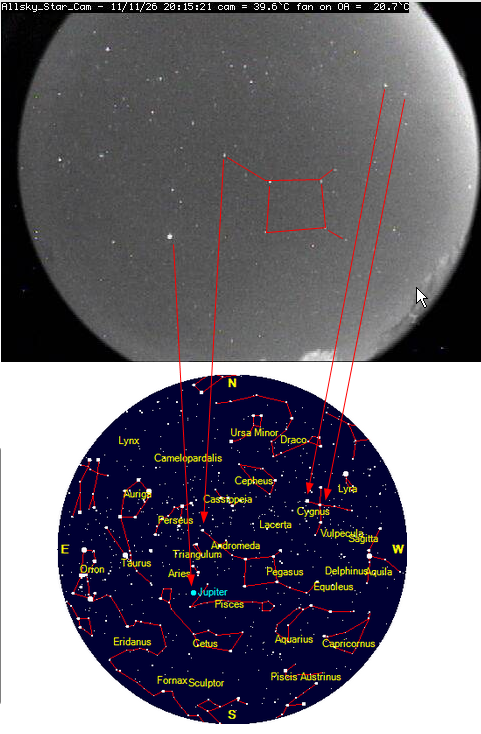 Here is what we have in November 2011 (We saw ‘first’ light with this housing on the 24th). 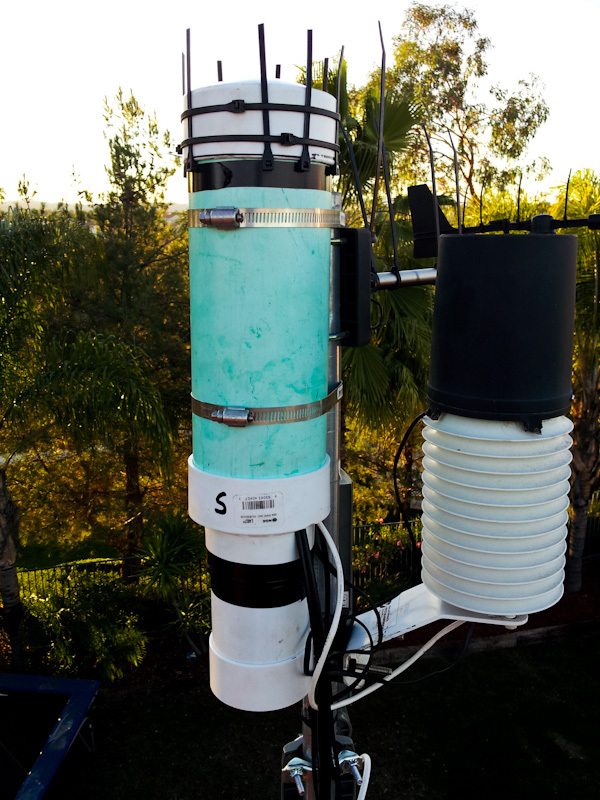 The camera is simply strapped to the same pole as the weather station. This keeps it all in one location and the roof does not look too cluttered (I’m in a pretty tight HOA area). The hope is that the white will reflect the heat. 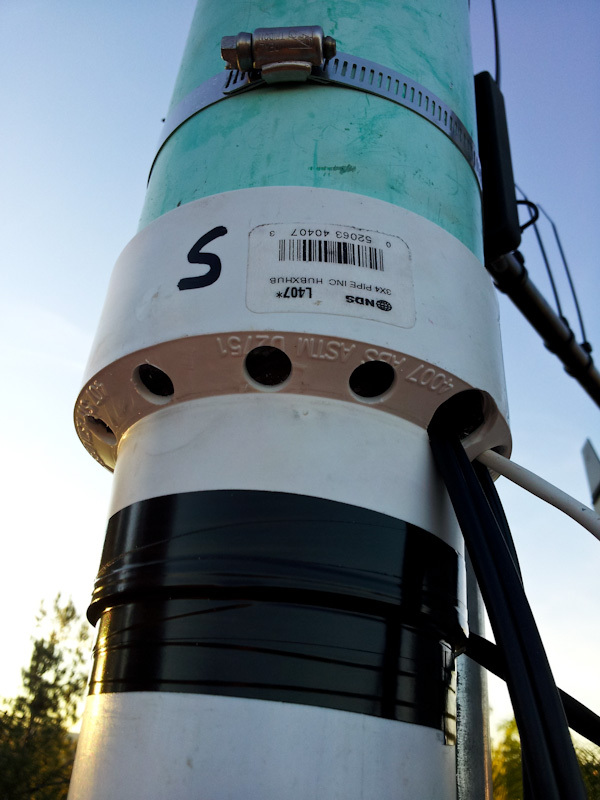 The camera electronics are mounted under that cap where you can see the sealant. 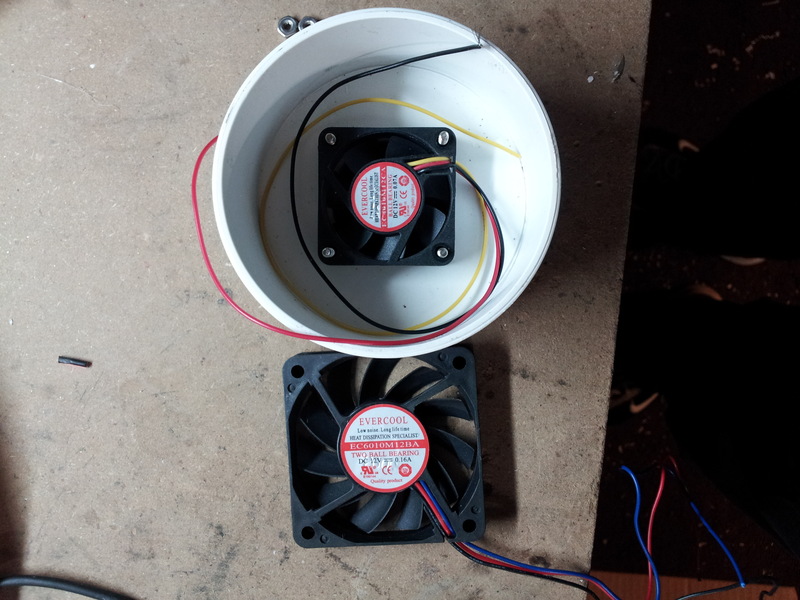 The cap attaches to a tube that runs all the way to the bottom of the housing where the fan is located. You cant see it, but around the cap are air holes. So the fan blows air up the tube, around the camera electronics, then back down the air space between the two housings and out the holes you can just see in this photo. As you can see, two of the holes are made bigger so that we can pass the power, video and control cables up to the camera. These holes and all the others have fly screen over them. When the fan is running, you can feel the air blowing out of these holes. 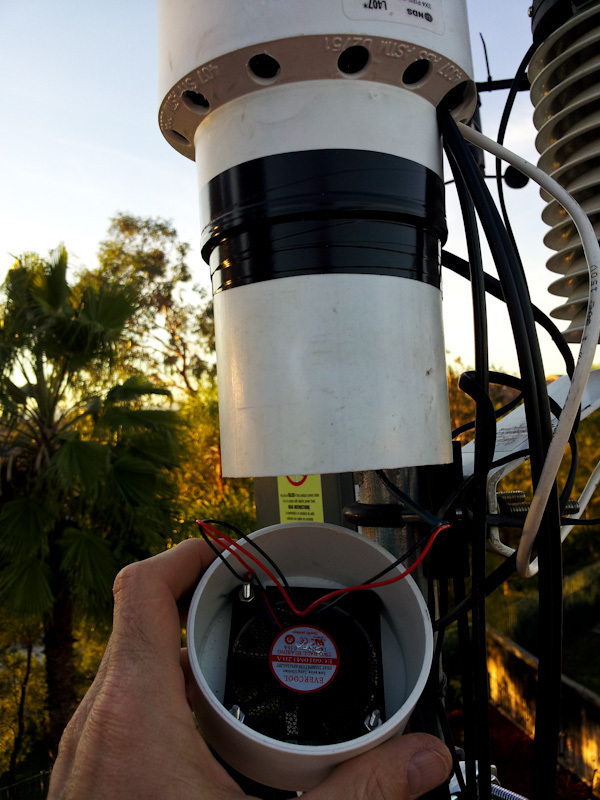 Hopefully you can now see how we have attempted to ‘double insulate’ the camera from the SoCal summer heat. Only time will tell how well it works. I have hit two problems thus far. 1. The fan was too small. It made no difference on the temperature at all. Thankfully I found a larger on in my ‘junk box’. I swapped it over and it can get the camera temperature down over about 20 minutes. 2. I have a problem with condensation. It only rarely happen in Australia, so I am scratching my head a little as to why its such a problem here. I have noticed that is worse if I run the fan in the evening, so that’s the first thing we will stop. But, like I said, it still happens with the fan off. Watch this space I guess as we try and solve this little problem. The last problem is just something we are going to have to work on……. As you can see from the photos above, I have put some zip ties around the edge, I don’t like they show up in the image, but its better than having the view blocked by birds and their…. ah…. leftovers….. It shows some promise, here is a screen shot (before it fogged over) that compares it to a star map so that you can get a feel for what it shows on a moonless night.